Hi my Inside-Out Beauties ! Today I finally got to upload this video makeup tutorial that I actually filmed 2 weeks ago!!! You know what they say "time flies" "so little time, so much to do", etc etc etc. I have my share of excuses, but the important thing is it's here! Yaaaay! The idea behind this hair and makeup tutorial, was to inspire you to try a new look that would resemble someone right out of the ocean or a swimming pool (but in the movies only, because it's unlikely that in real life you would still have this much makeup on after going for a swim). Anyways, after giving it some thought I named it "THE WET LOOK"! 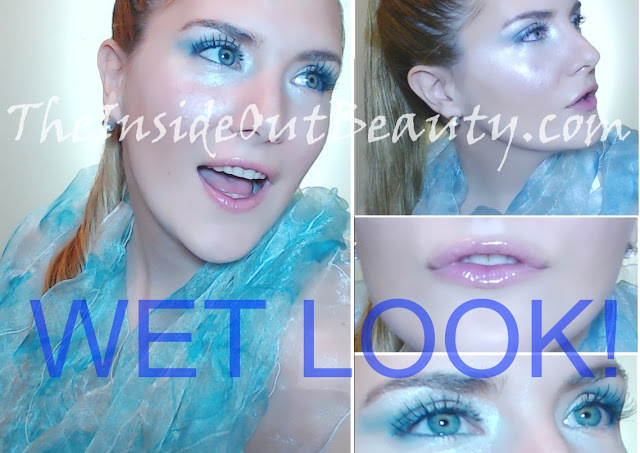 Before we jump into the video makeup tutorial, let me quickly list you the products I've used, and that you'll need if you want to try this WET LOOK yourself. 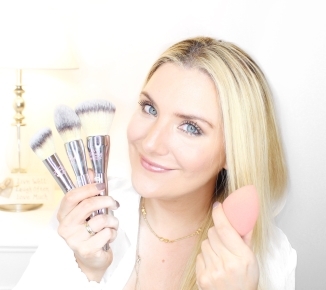 Today I wanted to make this quick tutorial on how you can start your own beauty blog. I know some of you may already have one, but I get tons of Tweets, DMs and Comments on G+ every single day asking me: "How do I start a Blog?". So I finally decided to make a post explaining this in 12 EASY STEPS, so you can start blogging in just a few minutes. INNER BEAUTY | WHY YOU SHOULD NEVER BE AFRAID ! This is my 100th blog post! 100 !!! Can you believe it??? THANK YOU SO MUCH! I am truly grateful at how much support you give my blog everyday and I get so many tweets saying thank you for this post, or that interview, or that video really helped me... You have no idea how happy it makes me feel. FASHION | TOP 5 INDIE DESIGNER PICKS ! The indie design movement is made up of independent designers and craftspeople who design and make a wide array of products, often handmade as opposed to those mass-produced ones from large corporations. This is what makes their jewellery , accessories and clothing unique! And personal style, in my opinion, has a lot to do with unique items. So I've picked my Top 5 items of the month from the website MadameKuku.com , to share with you just a few examples of what some these amazing designers have to offer to all of us. If at any time, you'd like to learn more about an item, just click on its picture. #1♥ My first pick is this black and white stand-up collar dress, designed by Karliene. This elegant fitted and long sleeve dress is an item all of us should have on our wardrobes. FASHION | PONCHOS: IN or OUT ? As some of you may know, ponchos have become very trendy, and hit the runways across the world. Happy Saturday my Inside-Out Beauties! 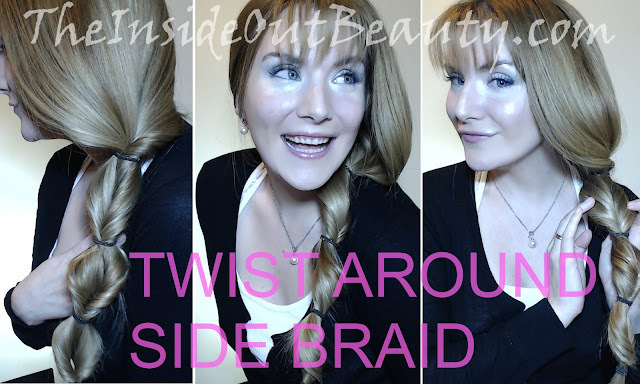 This time, I wanted to show you how I make a Twist Around Side Braid! I think it is the PERFECT time for this tutorial, since many of you are in Summer now, and this is a great hairstyle for the beach or any summer vacation destination. FOOD & LIFESTYLE | WIAW: Spontaneous Romantic Candlelight Dinner Out! It was kind of a spontaneous date night with my husband! We were out for a quick walk and we ended up on this new gorgeous little place having a candle light dinner. I can confirm today that Lola, the exotic shorthair kitten I got as an Anniversary gift from my husband, has changed my life... for the better of course! Many of you know the story of how much I've been longing to have a kitten and why. I cannot really find the words to describe how much joy, peace and love she has brought to both my husband and I. This brings me to today's post. All the positive feelings awoken by having a pet at home, are no secret to humans. We have been adopting domestic animals for ages, and there are many benefits of having them around that can boost your Inner Beauty! Inner Beauty is about everything that happens inside of ourselves, what we eat, what we think, how we feel about ourselves and about everything around us, our physical health, etc, etc, etc. Just keep reading to find out more about the top 4 benefits of having a pet and how it can help you boost your Inner Beauty! Happy Motivation Monday my Inside-Out Beauties! Today I wanted to talk briefly about the Power of Smiling :) so we can start this week with a positive attitude. REAL LIFE | A LOOK BACK AT ... SUMMERTIME! Can you believe it's JUNE already!!! When did this happen girls? Great thing we always have amazing memories and plans ahead... and also winter is not that bad here either! But I thought it would be a great idea to share with you one of the things I love doing the most during summertime, and that is going on a road trip adventure! Last summer, we filmed this vlog, where you can see a little of Buenos Aires too! I know many of you are very curious about my city, so you sure will enjoy this one. You enjoyed How to Survive a Long Distance Relationship PART 1, now let's go deeper into this with a new story! Today's special guest is a loyal reader of TheInsideOutBeauty.com . I have invited Maddy to discuss her personal experience "surviving" a long distance relationship. Being in love and apart can be quite challenging for us women, so I thought her testimony and advice would be very valuable to us all. Thanks for agreeing to this interview Maddy. Let's start with the basics: is a long distance relationship even possible Maddy? Yes! Of course it is. I love my boyfriend VERY much and I would do anything to be with him, however being in a long distance relationship is not for everyone and it takes a special kind of relationship to be able to withstand one. You have to be able to deal with many lonely nights away from him. That's probably the hardest part. Not being able to actually talk to him and having to rely on technology in order to talk to him is a challenge. If you can deal with both those things for long periods of time, then by all means a long distance relationship is very possible. That's so true Maddy! How long have you been in a long distance relationship? As many of you know, most of the year, I 'm a French Manicure girl! It's just so versatile and wearable. After my Kate Moss Red Lipstick post, I was inspired to go over to the drugstore to find a nail polish that could match that shade of lipstick to complete the "Lady in Red" Look! The closest one I found was this one from Maybelline New York Forever Strong PRO.